Roger Varian reflected upon one of the highlights of his career after Postponed silenced the doubters with another classy performance. What appeared set to be a routine victory when the 15/8 favourited sauntered to the front two furlongs out proved to be anything but as Postponed began to drift to his right under Andrea Atzeni's drive. The rider had his whip in the correct hand but it meant that Paul Hanagan and Mutakayef, who had emerged as seemingly the main challengers, ran out of room as they looked to make their run against the stands' rail inside the final furlong. That left Highland Reel (6/1) to claim the forecast spot, battling on well having been done for speed as he tried to challenge at the same time as the eventual winner when pacemaker King Bolete began to beat a retreat. The winning distance was a length-and-a-quarter with Mutakayef a further length away in third. Atzeni said: "He's great, isn't he? A lot of people had doubts about him - I never had. "He's got too much class. I think people under-rate him. I think he's one of the best in the business we've seen for a while." Postponed had been forced to miss the King George VI and Queen Elizabeth Stakes at Ascot last month after being struck down by a respiratory infection. 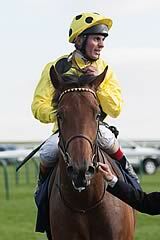 A delighted and relieved winning trainer Roger Varian added: "He's an incredible horse. The team at home have done a fantastic job. We didn't have long to get him ready. He wasn't right three and a half weeks ago for the King George. "He turned the corner two weeks ago. In the last seven days he looks to have blossomed. A week ago I wouldn't have known if I was running him here. We're not having loads of winner at the moment, so you're never quite sure. I trusted in the horse's condition and he delivered. "I think it's a turning point. I can see the signs in all the horses at home they are coming back to life and back to good health. I think it will be two or three weeks yet before we hit full stride, but come September we'll be ready to roll. "I'll talk through plans with his owner, but I would think it unlikely he'll run again before the Arc - it will give us plenty of time to tune him up for that race. "I'm not sure this is as spectacular as some of his wins, but I thought he stamped himself as by far the best horse in the race." Highland Reel tried to go with Postponed when the winner was sent past pacemaker King Bolete three furlongs out, but having been unable to go with his rival, he emerged with credit here, staying on again for second place. 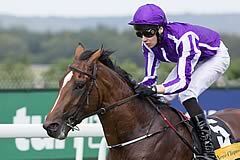 "That was a very good run," said trainer Aidan O'Brien. "He's still progressing, this horse. He's physically getting stronger and I'm delighted with him. I'd say he'll travel plenty, he loves it. "He's in all the Australian races but he could go somewhere before that. Timing-wise, I'd say the Irish Champion Stakes could be the one, but there's also a race in America, the Sword Dancer (at Saratoga), he could run in. "He's a proper fast-ground horse but he also handles soft, he's versatile and he's as good over 10 or 12 furlongs. We've got lots of options with him." William Haggas was proud of the unlucky-in-running Mutakayyef, although there was a slight sense that a winning opportunity might have been missed. The Newmarket handler said: "I thought he was going to win, but Paul (Hanagan) said he just ran out of room. The winner started his run down the middle but ended up near us on the near side. I would have just liked them all to run in a straight line so we could have known. "He got the trip but we knew he would as he has won over it before. He's come of age this season, I'm chuffed to bits with him. "The only race we have in mind for him is the Dubai Duty Free (Dubai Turf at Meydan next March) - that's what the owner wants to go for and it will suit him down to the ground. Obviously, he'll run before but where I don't know."